Ainslie School has a very skilled team of physically active teachers. Many teachers are also athletes who actively participate in competitions, training and sporting teams outside of school hours. We offer a range of sporting opportunities and has a well stocked sports, physical education and gross motor storeroom. Children participate in P.E. lessons every day therefore it is essential that they wear suitable clothing and footwear. Opportunities are available for students of all levels of ability. Central to the classroom physical education program is the explicit instruction of fundamental motor skills. Students in K-2 also participate in structured gross motor activities that allow the children to practise these skills. Most skills used in sports and movement activities are advanced versions of fundamental motor skills. For example, throwing in softball and cricket, the baseball pitch, javelin throw, tennis serve and netball shoulder pass are all advanced forms of the overhand throw. The presence of all or part of the overhand throw can be detected in the patterns used in these sport specific motor skills. Children normally develop motor skills in a sequential manner. Fundamental motor skills comprise one level in the continuum of motor skill acquisition. At this stage, children are building upon previously learned movements and preparing for the acquisition of more advanced skills. Ainslie School convenes an Athletics Carnival, Cross Country Carnival and Swimming Carnival every year. Students are awarded participation points for their house as well as for gaining a placing in an event. We participate in North Canberra PSSA events allowing our outstanding athletes to compete at ACT and National level. Students who also excel at a particular sport that is not included in our carnivals, have the opportunity to trial and represent the school at competitions across our school network. If successful at this level, through School Sport ACT, students can progress to State level and then represent the ACT at National level sporting events. Many of our teachers are athletes themselves, and coach representative teams for the ACT Education Directorate. Ainslie School has a strong school camp culture. Students learn new skills, engage in challenging activities, develop teamwork competency and a level of independence, all in a safe and nurturing environment. Ainslie School hosts a variety of sport clinics throughout the year. These clinics explicitly teach the students the skills required to play a sport. In 2015 and 2016 Ainslie School successfully applied for grants from the Australian Government’s Sporting Schools Program to conduct sporting skills clinics in gymnastics, cricket, basketball and athletics. This year, AFL NSW/ACT is also providing skills clinics for students from K-6. 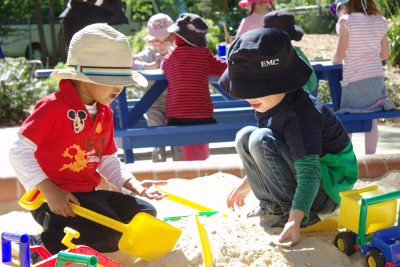 In addition, Ainslie School participates in a range of 'play days' across Canberra. In 2014 this included, cricket, soccer and Buroinjin. 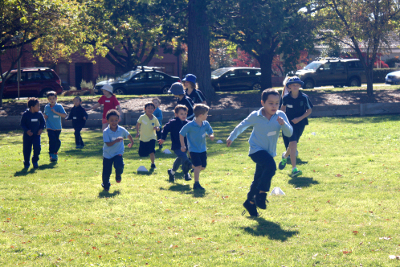 The Ainslie School community organises a range of physical activities every year that promote a healthy lifestyle. Tryathlon: a strong contingent of Ainslie School participated with thousands of others in the Tryathlon held at the AIS in February. The students swam, cycled and ran with great enthusism. Mother's Day Classic: Ainslie School regularly enters this team event. In 2014, our school won a trophy and voucher for having the largest school team in the event. Ainslie's preschools do not program for children to participate in 'sport' as such. Traditionally, preschools have offered children opportunities to play for periods inside and periods outside. The Early Years Learning Framework (EYLF) and the National Quality Standard (NQS) do not make distinctions between indoor and outdoor locations. Ainslie School's preschool units therefore create indoor and outdoor spaces (using natural and purpose built resources, fixed and modular equipment) with learning in mind demonstrating that play can be a catalyst for learning everywhere.This involves setting up each space to encourage, support, and challenge children to explore, investigate, problem solve, imagine, create and experiment. The educators are actively engaged with children and experiences in order for learning to be deepened and extended.